Figure out how long and tall you want your retaining wall and make sure there is enough space for the wall blocks to fit. Using stakes and string, map out where you want the wall to be installed. If your wall is going to curve you can use a water hose or spray paint. 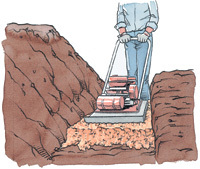 Before you start digging, call your local utility service that provides a free service of marking underground utilities and cables that may be in the area where you plan to install. The most important step is the base preparation. 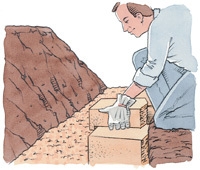 When excavating the trenches for the wall block, keep in mind the bottom row of blocks should be buried about 1 inch for every 8 inches of wall height. By doing this you will provide strength and stability of the wall. 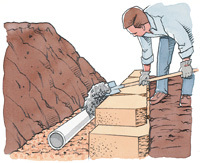 As you are digging the trench, use the level to make sure the trench is level as you compact the soil. You should use a crushed stone or crushed concrete for the base material. 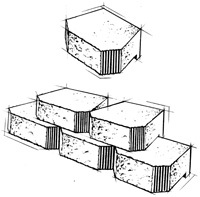 The base should consist of angular, sharp edged particles, not rounded as they will sink into the ground when under pressure. Using round particles will affect the wall in the future as they move underground. Lay about 4� to 6� layer of the base material and compact making sure it stays level. Compact the material making sure that it is compacted enough for you to walk over the area where there is no shift at all. 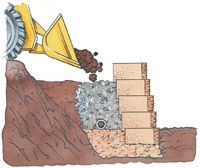 When the base material is compacted it is also recommended to spread a 1� layer of coarse sand. This will help the wall settle evenly. So, make sure the sand is level also. Lay the first row of blocks straight onto the base material. The edges should be touching when placing the blocks into place. 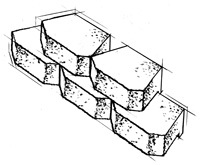 As you place each layer make sure it is level on all sides; top, bottom, front and back. Take your time with this step because it will make for a sturdier wall. Once the installation of each row is complete you should backfill the area where the blocks were installed. 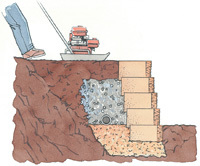 Crushed stone or crushed concrete is recommended for this step also. The backfill will help with water drainage when the wall is complete. 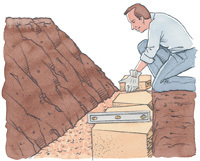 Compact the backfill behind each layer before starting on the next row of blocks. Make sure the top of each brick is cleaned off before placing another brick on top of it. Using wall caps will help to stabilize and protect your wall from erosion and weather conditions. 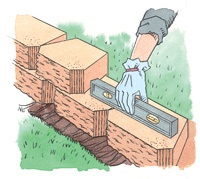 Capping will help ensure that your retaining wall stays sturdy and lasts longer. You can either concrete the cap onto the top layer or apply a concrete liquid adhesive to make sure the caps stay in place.